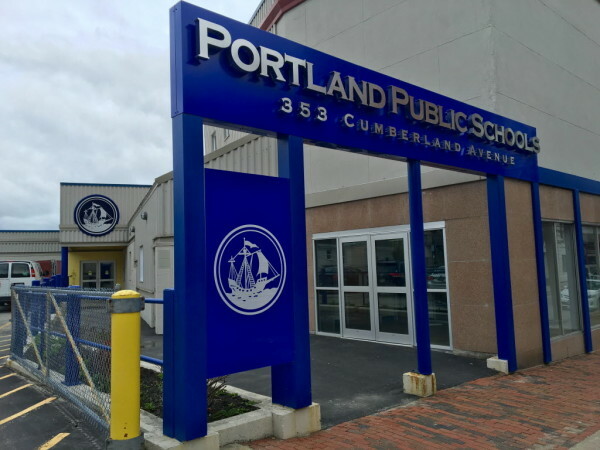 The central offices of Portland Public Schools can be seen on Cumberland Avenue in Portland in this May 2016 file photo. Portland’s public schools are making a commitment to improve communication with new Mainer families. Reducing the reliance on pre-recorded phone announcements and increasing the availability of interpreters at home-school events are two changes under consideration, as the Portland Press Herald reported this week. To make our schools more accessible, faculty and staff should definitely improve outreach to these families — but that isn’t enough. To make our schools excellent and accessible for all students, we need to find ways to incorporate immigrant families’ knowledge, language skills and wealth of experiences into our teaching and curriculum. Some members of our community may not be persuaded that it is worthwhile to reach out to families who are learning English and who may be unfamiliar with U.S. schools. Here’s what the peer-reviewed research says: Parental involvement in schools increases student academic achievement; higher student achievement usually leads to better school climates, and community outcomes and family engagement in schools can improve the lives of the entire family and community. But better outreach and service to immigrant families is only one component to school engagement. Portland schools’ faculty and staff also need to tap the knowledge and experience immigrant families can share. Our immigrant families bring language skills, geopolitical insight and cultural knowledge that we miss out on if we reduce their involvement to multicultural potlucks. Improving communication and outreach with immigrant families not only benefits the families, it enables teachers to better do their jobs. Improved communication is not only for the purpose of telling families what they need to know. Two-way communication, mentioned explicitly in the Parent and Family Engagement Manifesto — the document that lays out how Portland schools can support these families — enables teachers to find out what their students already know. Effective instruction hinges on teachers activating students’ pre-existing knowledge to build new understandings. What students and their families know might not be evident to their teachers, especially when they come from different cultural, linguistic and religious backgrounds. Teachers learn about their students, their families and the knowledge they possess through dialogue, engagement and immersion in their communities. Educational researchers and teacher educators realize that we must help teachers to become learners of their communities, in addition to recruiting teachers who share the backgrounds of our student populations. My teacher education students begin their senior fieldwork at King Middle School next week. In addition to observing and teaching alongside mentor teachers, they will investigate our community, study Portland’s immigrant enclaves, and engage with those who bring their hopes and dreams to our public schools. We begin by identifying resources and assets on neighborhood walks, listening to the voices of the school’s parents and students on New Mainers Speak, and sharing a meal and conversation with immigrant families about their school experiences. We need to do a much better job of reaching out to immigrant families, but we also need to be attuned to what we can learn in the process. Doris Santoro is a professor of education at Bowdoin College. She lives in Portland, and her daughter attends a Portland Public School. Doris tweets @DorisASantoro.